Brexit also called British Exit, refers to the withdrawal of Britain from the European Union. This has long been a political accomplishment that has been pursued by many individuals, political parties and advocacy groups. This has been the idea of these persons since the United Kingdom joined the EU in 1973. The withdrawal of member countries has been a right of the EU's membership since 2007 fully addressed under Article 50 of the Treaty on the European Union. In June 2016, Britain held a referendum on the matter and the result saw 49.1% voting to exit the EU while 48.1% to remain. Britain's departure from the European Union is filled with propaganda and myth but the risks are very real. Brexit could lower global status of the United Kingdom, diminish its quality of life, and throw its legal system into turmoil. 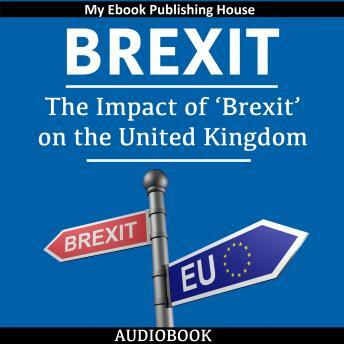 This is an audiobook about the Brexit phenomenon, stripped of the wishful thinking of its supporters in the media and Parliament. It is the real picture of a country about to undergo a sharp and self-inflicted isolation. This book is for people who still believe in evidence and in experts.